...The Panel currently reports data on demand in the province, but importantly this hourly data understates both supply and demand because it does not include hourly production from embedded generation. ...The Panel expects that data on embedded generation can be made available on an hourly basis by each metered facility. I'll note it's primarily important for the system operator, the IESO, to provide the data because there's no indication they have much understanding of the changes themselves - my 45 million cups of coffee poked a little fun at one impact of the IESO's forecasting foibles which I expect are from a failure to follow embedded generator output - and, more seriously, I dealt with how I have tried to account for it in Estimating production from Ontario's solar panels. I share the Panel's expectation that the data be available hourly too as the final quarterly report from the now defunct Ontario Power Authority displayed less than 23,000 contracts whereas the IESO already allegedly handles the MDM/R data repository for 4+ million smart meters. the Panel has reported on the response of Direct Class A consumers to the high-5 allocation of the Global Adjustment, some additional discussion on this topic is included in this report. Importantly, the analysis considers only the behaviour of Direct Class A consumers and fails to consider how the response of Embedded Class A consumers may differ. In light of the expansion of the high-5 allocation of the GA to consumers with demand of 3 MW or higher, it is likely that the pool of Embedded Class A consumers will expand considerably.70 This expansion will make it even more important for the industry as a whole to have access to Embedded Class A consumption data in order to understand how the expansion contributes to changes in demand in the province. I'll be posting original work on "Class A", now the ICI, on my Cold Air blog in the near future. The current totals that can be obtained from the IESO (by e-mail) make me suspect there are far less than one thousand of these consumers and the Panel is referring to data for maybe one-third of that. So, again, if the IESO is capable of managing the MDM/R this should be simple enough. I will once again argue to the OEB that until such time as the IESO indicates a capability managing data the funding of the MDM/R is frivolous: the OEB has a stick to wield in support of its Market Surveillance Panel's data request. ... the Panel is very interested in the extent to which apparent reductions in demand during the high-5 hours of the year are offset by increased behind-the-meter production. 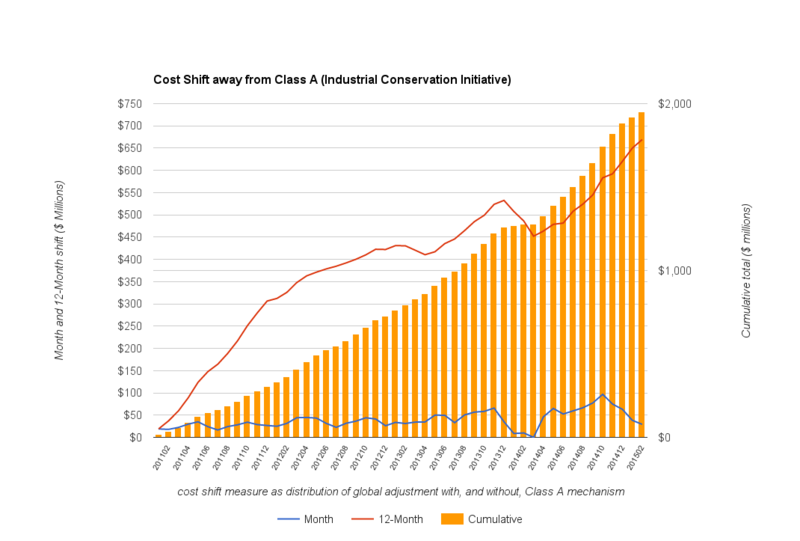 Such production would offset the reduction in demand due to the ICI, and likely contribute to inefficient outcomes if more expensive onsite generation is being used in place of lower-cost energy from the grid. Inefficient outcomes indeed. 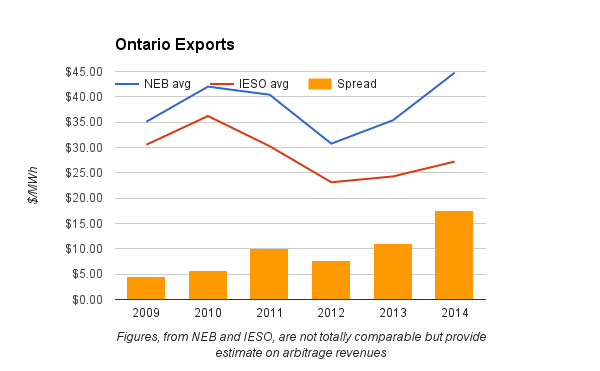 The current adjustment period's peak hour had Ontario exporting 3,794 megawatt-hours (net) at a rate ~40% less than the average rate paid by Ontario's beneath "Class A" ratepayers. Firing up the "behind-the-meter" generators is shifting hundreds of thousands of dollars, per megawatt, to other consumers - chances are pretty good it's inefficient. The elimination of Congestion Management Settlement Credit (CMSC) payments for all intertie transactions is argued for in depth. It's clearly technical and clearly the Panel is trying to stop gaming. The search for savings in export transactions is a welcome change from the panel's previous report in September, which I took exception with in Another rebuttal to an Ontario Energy Board panel's decree of subsidy-free exports. In the interim 6 months, 6 of the market's 10 highest net export months have been experienced. "TC" represents transaction costs and a footnote shows: "This report assumes total transaction costs of $5/MWh, which is assumed to be inclusive of external transmission reservation, uplift costs and the Ontario export tariff." I'll interpret that as supporting my Ontario is the sucker of first choice for off-price electricity post from January - particularly if the CMSC payments I didn't include are close to balancing out the transaction costs I also omitted. The $519 M for 2013 closely matches my estimates, so I assume the $1.2 billion "Since the change in allocation" is only to the end of April 2014 (the end of the period of this Panel report). Sometime in March the figure would have passed $2 billion.